Born around 45 AD, Pluatrch (later Romanized as Lucius Mestrius Plutarchus) grew up and spent most of his life in Chaeronea where he actively participated in local political and religious affairs. However, he did travel to Athens and Rome where he formed friendships with powerful patrons, such as Quintus Sosius Senecio, who would later become twice consul, and Lucius Mestrius Florus, who helped Plutarch obtained Roman citizenship. At Rome, where Greek intellectuals were highly sought, Plutarch gained the audience of importance men like Arulenus Rusticus, another future consul. Although Stoicism and Epicureanism influenced the ethical models of the upper class, Pluatrch preferred Platonism, defending the Platonic system and even writing dialogues that imitated Plato’s. These dialogues, along with various nonbiographical writings, was lumped into a single collection that became known as the Moralia. The writing is uneven and feels dated but would have enormous influence on writers like Montaigne and Emerson. 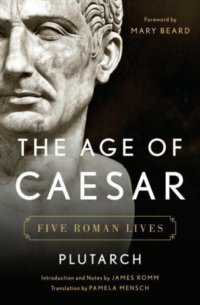 The Age of Caesar: Five Roman Lives focuses on an era where character and ambition of Pompey, Caesar, Cicero, Brutus, and Antony shaped a civilization. Plutarch’s biography allows us to compare Pompey and Caesar in their struggle to be masters of Rome; Caesar and Brutus as the life of action versus the life of statesman; Cicero and Antony where political self-advancement comes into conflict with base desires for combat and pleasure. The selection of these five lives paint a picture of the Roman Republic in transition, from civil war and to later Empire. It portrays the lives of those who shaped these events and provides political lessons that still resonant today. In the book, Mary Beard provides an excellent historical introduction of this period, while James Romm’s notes and maps help the reader understand the nuances of Plutarch without being overwhelmed by the history. Pamela Mensch’s translation also makes Plutarch accessible without sacrificing tone or style. Just as they did with Herodotus’ Histories, Mensch and Romm have accomplished another feat of making a classical text come alive in The Age of Caesar: Five Roman Lives. It is worth to read and reread not only for the history but for its moral truth.